Imagine living somewhere where traffic jams were a thing of the past, where ambulance crews started on-route to an emergency before anyone had dialed 911 and where critical infrastructure operated at maximum efficiency. This utopian city may not currently be possible, but the Internet of things could change that in the not too distant future. By connecting various aspects of the urban landscape to the Internet, local administrators will gain access to countless extra data sets that could help them provide better services for their citizens. These smart cities not only promise to improve the lives of their inhabitants, but also provide potentially lucrative commercial opportunities for a number of businesses. Although the concept of a "smart city" has existed for some time now, the Internet of things (IoT) is finally making it a reality. IoT devices are expected to revolutionize a broad spectrum of industries, from manufacturing to healthcare, so it is hardly surprisingly that urban planners, transport managers and infrastructure designers are getting on board. 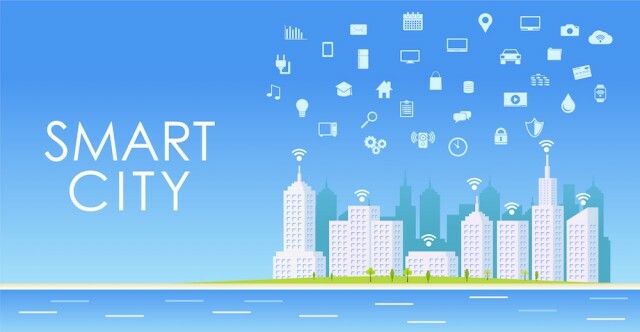 In fact, Gartner predicts that approximately 1.6 billion connected things will be used by smart cities this year, representing a growth rate of 39 percent when compared to 2015. "Smart commercial buildings will be the highest user of Internet of Things until 2017, after which smart homes will take the lead with just over 1 billion connected things in 2018", confirms research vice president at Gartner, Bettina Tratz-Ryan. Although consumers may not quite be ready to embrace connected devices in the home, outside of connected TVs and thermostats, in the meantime, smart cities could help demonstrate the potential benefits of the Internet of Things. And although connected traffic lights and parking spaces may sound futuristic, some forward-thinking companies are already making inroads in the smart city market. Smart cities could provide a significant commercial opportunity to many businesses. Not only could companies secure huge contracts to deliver a multitude of IoT services to the city, but they could also generate revenue by selling the data that they collect, providing that they have permission to do so. IoT data, as opposed to the connected devices themselves, is often viewed as being the real game-changer for the market and it is this information that will enable cities to deliver more efficient, targeted services. Here are a few cities around the world that are already using IoT technology to their advantage. Barcelona: The Spanish city has been quick to embrace IoT technologies, with smart traffic lights and a host of other sensors now a common feature of the urban landscape. The Internet of Things has been put to use in the irrigation system at the Parc del Centre de Poblenou and in the planning stages of new bus routes. In addition, Barcelona recently announced that it would be extending its partnership with Cisco to create an IoT platform that helps to simplify, accelerate and reduce the cost of deploying new services. Amsterdam: The Smart City initiative was launched in Amsterdam back in 2009 and has so far led to the creation of almost 100 IoT projects by businesses, the government and members of the public. Project examples include flexible street lighting, a connected traffic management system to reduce congestion and a dedicated IoT testing area, dubbed the "smartest street in the Netherlands". Milton Keynes: Slightly less well-known on the global stage than both Barcelona and Amsterdam, Milton Keynes is trying to make a name for itself as a pioneering smart city. Its MK: Smart project, which attempts to use energy and water consumption data, transport data, data acquired through satellite technology, social and economic data sets, and crowd sourced data to support economic growth, was a finalist at last year’s Smart City Awards. The project also places a great deal of emphasis on sustainability issues, such as meeting carbon reduction targets. These are just three examples of IoT and data analytics being applied in cities all over the world. In addition, India’s Prime Minister, Narendra Modi, wants to create more than 100 smart cities in the country, even though this will reportedly require investment in excess of $150 billion. The reason why governments are so keen to create their own smart cities is due to the fact that they can benefit their inhabitants and the wider economy. "The technology embedded in smart cities has the potential to transform our lives for the better", explains Jason Hart, CTO, Data Protection at Gemalto. "We’ve already seen new technologies such as NFC contactless payments or mHealth benefiting end users, saving time, bringing more efficiency to businesses and to society in general. There’s no reason to doubt as the technology improves, this will continue to improve the quality of life for future generations to come"
"Smart cities have the potential to draw in people from all over the world, providing services that span the digital divide, allowing citizens to interact and access things like government services at the touch of a button from healthcare and education to smart transportation and tourism", adds Hart. As mentioned above, cities looking to embrace IoT technology, data analytics and smarter services will need to invest significantly to meet this aim. Firstly, the transfer, storage and protection of such vast amounts of data requires extremely well developed network infrastructure. Security will also likely need to be improved, particularly if some of the data associated with smart cities is of a sensitive nature. Building and installing sensors into existing urban infrastructure could prove costly and face resistance from local administrators. Why should they spend money on smart traffic lights, when the unconnected ones work fine? Smart cities are already on the way and despite some challenges, they offer many potential benefits for citizens and corporations. Whether you’re an IoT hardware manufacturer or an organization looking to generate insights from public data, smart cities provide a huge number of new business opportunities.